The United Nations General Assembly, in its resolution 66/127, designated 15 June as World Elder Abuse Awareness Day (WEAAD). It is the main day in the year when the world voices its opposition to the abuse and suffering inflicted on older people. An increasing number of activities and events are held across the globe on this day to raise awareness of elder abuse and highlight ways to challenge such abuse. 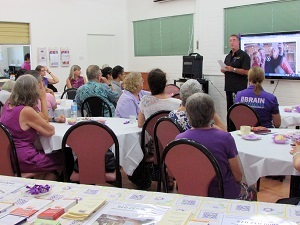 WEAAD is an opportunity for individuals, families, groups and organisations to speak out against elder abuse. 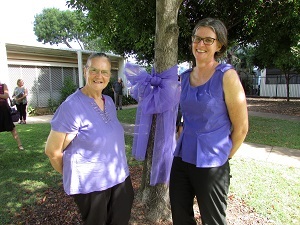 By doing something purple in June and telling people ‘why’, links into the world-wide elder abuse campaign for WEAAD. Whether it is making a purple cake for morning tea at work, giving purple flowers to an older person, or wearing purple to work – no attempt at raising awareness is too small. Organise or promote a purple themed picnic or sausage sizzle in your park. Organise and promote a purple themed awareness raising walk. Invite a guest speaker to discuss the issue of elder abuse. Wear purple to work during the week leading up to the 15th of June. Use purple lighting in your community to highlight the issue of elder abuse. Create an awareness display in your workplace, school, council, library or shopping centre. Use purple balloons at a purple themed morning tea at your workplace. Use social networking such as Facebook and Twitter – change your profile picture to purple. Include the WEAAD logo and information on your email signature during June.